Euro area Composite PMI rose in August while New Zealand’s trade deficit persisted in July. Will the EURNZD climb continue? Euro area economic data were positive on balance in last couple of weeks. While the GDP growth remained steady at 0.4% over quarter in second quarter and the industrial production decline remained at 0.1% over month in July, the business activity expansion accelerated in August as evidenced by uptick in Markit’s Composite PMI to 54.5 from 54.3 in July. Meanwhile the New Zealand trade deficit persisted in July and building permits decline accelerated. And the global dairy trade price index decline continued, albeit at slowing rate. Improving euro are statistics while New Zealand data remain weak is bullish for EURNZD. 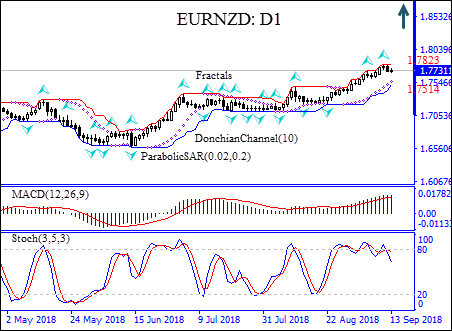 On the daily timeframe EURNZD: D1 is trading with positive bias since beginning of June when it retraced higher after hitting eight-month low. The Donchian channel indicates uptrend : it is tilted up. We believe the bullish momentum will continue after the price breaches above the upper Donchian boundary at 1.7823. This level can be used as an entry point for placing a pending order to buy. The stop loss can be placed below the lower Donchian channel at 1.7514. After placing the pending order the stop loss is to be moved every day to the next fractal low, following Parabolic signals. Thus, we are changing the probable profit/loss ratio to the breakeven point. If the price meets the stop-loss level (1.7514) without reaching the order (1.7823) we recommend cancelling the order: the market sustains internal changes which were not taken into account.